Value for money backpack vacuum. 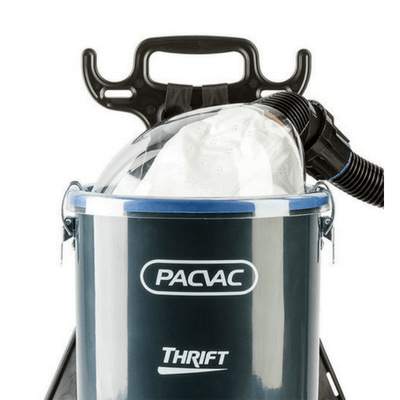 The Pacvac Thrift 650TH commercial-quality backpack vacuum delivers upon its promise of durability and value for money. With strong suction and a high-performing motor, it is one of the most popular backpack vacuums available on the market. 1,300 watt single stage flow-through motor. Two year body and motor warranty. Designed with OHS and user comfort in mind. Hi-flow filter offers optimum suction. Strong and durable canister with a 5 litre capacity. Hard-wired short lead with an 18 metre extension cable. Extra reusable flat bottom dust bag. 18 metre extension cable (lead). Vacuum hose and bent hand piece.